The rise in popularity of photography made room for growth in the market for tripods and other photography equipment.These days you can go to a local store to purchase generic tripod heads at a low cost but it does not come without serious draw backs. Cheaper equipments set unrealistic standards like how much weight it can support without sacrificing the functionality of the equipment. 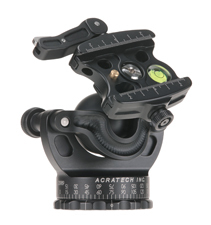 Acratech manufactures quality and innovative products for photography and imaging such as ball heads, panorama ball heads and quick release tripod heads using the finest material and top notch workmanship. The company employs professionals who aren’t only skilled craftsmen but are skilled photographers as well, ensuring the quality of the materials and work put into each piece because the employees share the same passion for the craft. In 1999, Scott Dordick; founder and CEO of Acratech designed the original prototype for the Ultimate Ballhead. Scott built the prototype for his own use because he could not find a lightweight ball head that was strong enough and would also work well while travelling. Scott was only persuaded to market his ball heads by the people who would ask him where he got them after seeing his prototype. Scott’s mechanical abilities fuelled by his passion for photography; gave birth to innovative Acratech products that are well designed and first class in quality.